The bread gets crusty warmed up in the panini and the cheese starts oozing out the sides. 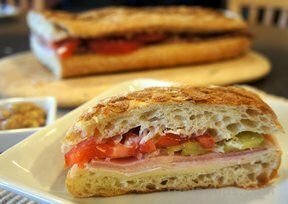 Tomatoes, onions and pickles add texture to this sandwich. This sandwich is perfect for a quick and delicious summer lunch. Corn on the cob is perfect for any summer lunch. See step-by-step instructions on four different methods for grilling sweet corn. Everyone loves a picnic and it is a fun way to enjoy a summer lunch. Follow these tips and you are sure to have a great picnic lunch.